The lack of a traceable provenance for the House of Yahweh inscription leaves many questions in the minds of scholars. The item needs to be subjected to a variety of scientific tests, many of which have already been performed, to authenticate its legitimacy. Among the chief critics objecting to a rush to judgement are a group of scholars often referred to as either the Copenhagen Group or minimalists. They believe that biblical Israel originated in either the Persian or Hellenistic era, and that evidence for an earlier existence is unreliable. While some of the chief proponents of this view teach at the University of Copenhagen, including Thomas Thompson and Niels Lemche, thus the name Copenhagen Group, the circle includes a larger number of mostly European scholars including Philip Davies at the University of Sheffield in England. While acknowledging a number of archaeological finds that seem to have biblical parallels, they note that there is little evidence that these finds refer specifically to biblical Israel. The Merneptah stele from the 13th century bc, for instance, mentions the name Israel but lacks sufficient data to indicate that this Israel was the biblical Israel as opposed to a group of people known as Israel that may have given their name to a territory that was later occupied by the people who became biblical Israel and who took their name from the pre-existing territorial name. Recent finds, however, have generated a lot of conflict between the minimalists and the mainstream. Not only do we have this new House of Yahweh inscription, apparently dating to between the ninth and seventh centuries BC, we also have the recent House of David inscription (see illustration above) dating to about the same time frame. Among the arguments raised by the Copenhagen group is that the format in which the controversial letters are arranged has led to an erroneous translation of the names. 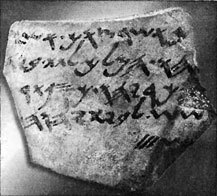 Other inscriptions, such as one found at Tel Dan, as well as the Mesha stone, generate additional challenges. Some minimalists even suspect that some of these inscriptions may be either a hoax or dated to the wrong time period.